In an email to students, faculty and staff, the university announced Tuesday that its contract with Aramark will end this summer and that the search for a new food provider will begin immediately. The Chimes reported in March of last year that the university signed a 10-year contract with Aramark, where Aramark provided $3 million up front for the university to upgrade facilities, and promised $100,000 each year after that. A clause in the contract allowed the university to leave the contract at its discretion. Bill Mea, the university’s vice president of business and finance, said that the decision to terminate the contract with Aramark came due to “food quality, health and safety and customer service” concerns from the campus community. “We worked with Aramark to try to improve this situation, but we ultimately decided that hiring a new provider would be in the best interest of the community,” Mea said. 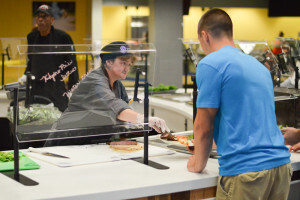 In Tuesday’s email, the university said that there were not expected to be much change to the meal plans, and Mea said this includes meal plan prices. A big concern following this announcement are the jobs of current Aramark employees who have become part of the campus community. Dining options affect most of Capital’s traditional undergraduate population; two-thirds of them live on campus, and most of those students have a meal plan. “Professionalism and variety” are the things Joey Weingartner, a junior financial economics major, hopes a new food provider will bring to Capital’s dining options. With the knowledge of Aramark’s critical food safety violations in September, which the Chimes previously reported on, cleanliness of a new food provider is important to many students. “I’ve seen a lot of … lack of protocol with cleanliness and things with Aramark employees, so I would love to see everything be very stuck to the protocol with the new food service,” Maggie Hitesman, a first-year nursing major, said. She said this lack of cleanliness (unchanged gloves, food sitting out too long, etc.) has made her unwilling to eat the food. She also said some of her friends are “sick from the food all the time,” and she’d like for that to change. Another important aspect of dining on campus is how early and late the MDR and One Main are open. “We’ll have early morning soccer games and then [One Main and MDR] won’t be open, and then we’re kind of screwed for food,” Jayde Hoffmann, a first-year exercise science major who is part of the soccer team, said. Tuesday’s email said student leadership will be involved in the process of selecting a new food provider. It also includes a survey link for students to share the top three things they’re looking for in a new food provider.